BATON ROUGE, La. – The No. 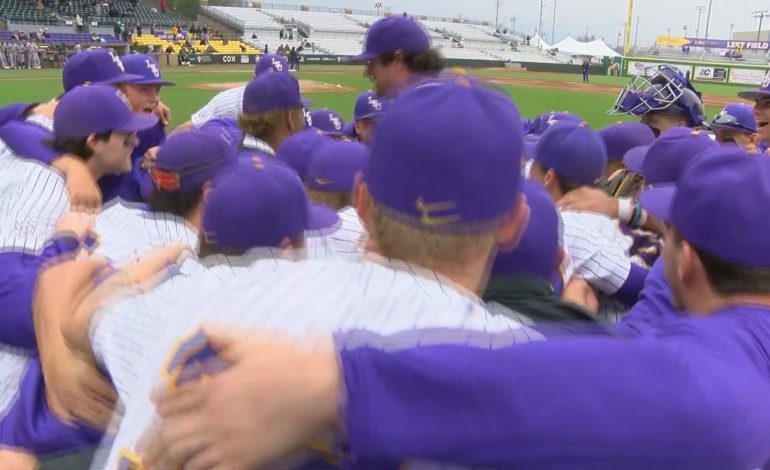 9 LSU baseball team split a doubleheader with ninth-ranked Texas A&M to walk away with the series victory Saturday in Alex Box Stadium, Skip Bertman Field. In Game 1, the Tigers rallied for four runs over the final six outs but dropped the first game of the doubleheader, 6-4, which allowed Texas A&M to even the series. The Tigers surged behind Cole Henry’s dominating eight-inning outing and Zach Watson’s 4-for-5 night at the plate in the second game to capture the series. LSU is 23-10 overall and 8-4 in the Southeastern Conference. The Tigers are in a first-place tie with Arkansas and Ole Miss in the SEC Western Division, and LSU is just a half-game behind Georgia (8-3) in the overall league race. Texas A&M is 25-8-1 overall and 7-4-1 in league play, as the Aggies dropped an SEC series for the first time this season. The Tigers return to action with a road trip across town to Southern Tuesday. The teams will meet at 6:30 p.m. CT in Lee-Hines Field in a game that will be available online through ESPN+. Fans can listen to the game on the LSU Sports Radio Network, including 98.1 FM in Baton Rouge. Live audio is available at LSUsports.net/live. Texas A&M lefty Asa Lacy (6-0) worked six innings in the win. He struck out 11, walked four and allowed one hit. Sophomore right-hander Eric Walker (2-2) pitched four innings and suffered the loss. He allowed three runs on six hits and recorded five strikeouts. In the top of the second inning, a leadoff double to right field by catcher Mikey Hoehner and walks drawn by second baseman Bryce Blaum and center fielder Zach DeLoach set up a two-out double from left fielder Cam Blake. Three runs scored on the play to give the Aggies the early 3-0 lead. Blaum reached on a throwing error and then advanced to second to start the seventh inning. Shortstop Braden Shewmake then tripled down the right field line to score Blaum, and pinch hitter Chandler Morris singled to right-center to score Shewmake, which extended the Aggies’ lead to 5-0. Right fielder Logan Foster drew a walk to start the eighth and then scored on a fielding error where Blaum reached second to give Texas A&M the 6-0 lead. In the bottom of the eighth inning, the Tigers plated three runs to cut the Aggie lead to 6-3. With runners on the corners after a leadoff walk by catcher Brock Mathis and a single to right field from shortstop Josh Smtih, center fielder Zach Watson singled to center field, which drove in Mathis. With one out, third baseman Chris Reid slapped an RBI single to right field to bring in Smith. First baseman Cade Beloso stroked a single to center to drive in Watson and make it a 6-3 game. Left fielder Giovanni DiGiacomo stroked a triple down the right field line to start the ninth for the Tigers. He then scored on an RBI single to left by Mathis, which cut the Aggie lead to 6-4. Matthew Beck, a right-handed junior tossed 3.0 innings allowing two hits and two runs, both unearned. He also struck out two. Junior Todd Peterson went 2.0 innings and allowed one run, which was unearned. Freshman Cole Henry (3-1) earned the win after he allowed two runs in the first inning and blanked the Aggies across his final seven innings. The right-hander allowed six hits and tied his season-high of nine strikeouts. Watson finished the night 4-for-5 at the plate and was a triple shy of the cycle. The junior drove in three runs and scored three runs. Sophomore Chandler Jozwiak (3-3) was charged with the loss after allowing three runs on four hits. The southpaw walked one and struck out two in two innings. The Aggies used five additional pitchers in the game. They combined for six innings and allowed six runs on eight hits, walked two and struck out eight. Texas A&M second baseman Bryce Blaum was hit by the first pitch of the game and then moved to second on an infield single by left fielder Cam Blake. With one out and the runners in scoring position after a double steal, catcher Mikey Hoehner ripped a two-RBI single up the middle to put the Aggies up 2-0. In the bottom of the third inning with second baseman Hal Hughes and catcher Brock Mathis on first and second after a leadoff single to right and a walk, shortstop Josh Smith singled through the left side to load the bases. Watson slapped a ball straight at the shortstop for a double to clear the bases. The Tigers re-loaded the baes with two outs for first baseman Cade Beloso, who slapped a single to left field to drive in Watson, giving LSU its first lead of the day, 3-2. Watson extended the LSU lead to 4-2 with one out in the bottom of the fifth when he crushed his third home run of the year, a solo shot to put the Tigers up, 4-2. With one out in the bottom of the seventh and Smith on first after being hit by a pitch, Watson ripped a single to left field for his third hit of the night, putting runners on first and second. After the Aggies went to the bullpen, right fielder Antoine Duplantis singled to center field to bring in Smith. Chris Reid hit a sacrifice fly to deep left field, which allowed Watson to score. Duplantis advanced to second on a wild pitch and cruised into home on a single by designated hitter Brandt Broussard to extend the LSU lead to 7-2. In the bottom of the eighth inning with catcher Brock Mathiis on first after a one-out walk, Smith homered to right-center for his fifth home run of the season to pad the LSU lead, 9-2. Texas A&M brought in a run in the top of the ninth inning. With one out, Hoehner placed a ball right next to the first base line, which stayed fair for a base hit. The catcher moved to second on the wild pitch and scored when right fielder Logan Foster singled up the middle to make it a 9-3 game. Ma’Khail Hilliard fired the final inning for the Tigers and gave up one run on two hits and struck out two to secure the win.